Beginning with a list of memories from her own childhood, Joan Marie Galat wrote a book from the perspective of her younger self. 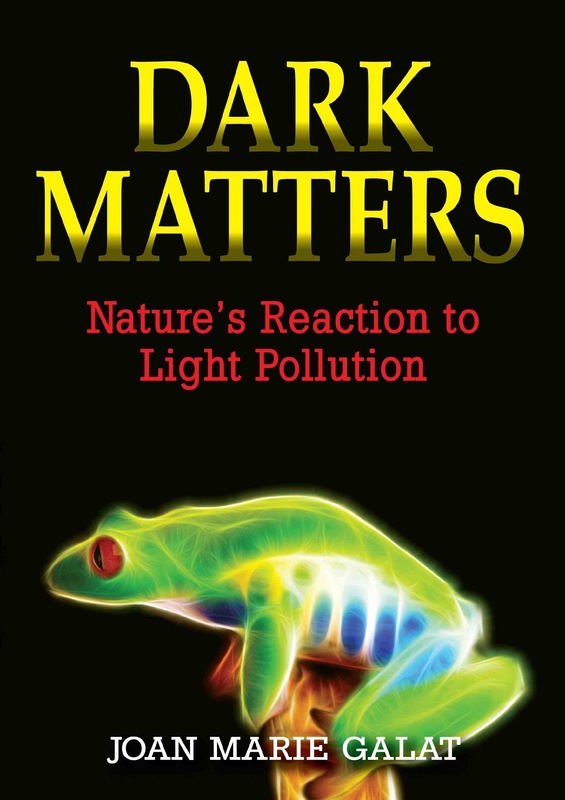 Dark Matters—Nature’s Reaction to Light Pollution is Galat’s most recent book and was inspired by the author’s interest in astronomy. “When you write a book, you spend a long time researching, so you have to be passionate about the subject,” says Galat. She has written about 20 books so far, with several that explore astronomy, nature, and the environment. Galat’s goal for this book was to inspire readers to think about the night sky as part of the environment. The more she learned about the night sky, the more she realized that light pollution was a problem and that the stars are being washed away by artificial light. When she discovered that light pollution is a problem for wildlife too, she realized that it’s not common knowledge that light has other consequences and wanted to share all the fascinating facts she had discovered. While writing the book, she thought, “Young people are going to care most about the animals.” She chose to include stories about birds, bats, sea turtles, and other animals to make the issue personal, allow readers to relate to the science, and put a face on the issue. The book is written for children aged 9 to 13, but the content will interest anyone who isn’t familiar with the problem of light pollution. Galat believes that stories help people remember facts and make learning fun. With a technical diploma in biological sciences and ecology, Galat was well-positioned to ask the essential questions readers may wonder about how light impacts wildlife and the night sky environment. She also has a background in public speaking and used to work in radio, so she is very comfortable doing presentations and outreach with her new book. She enjoys taking her show on the road and along with encouraging audiences to think like a scientist, she also stresses the importance of literacy. She talks to “anybody who will listen” — most often family audiences at libraries and students in schools — and makes sure that everyone can find the North Star before she leaves a presentation. Organizations in Canada are eligible for funding to bring Galat’s presentation to their location. She can also present via Skype. Galat believes that the night sky is free entertainment and that we shouldn’t have to travel to see it. From her home in Alberta, Canada, Galat can see the northern lights and the Milky Way. She says her area is pretty dark compared to others, but it’s not perfect. Galat thinks that light pollution is something we can solve but people need to be aware that there is a problem. She hopes that by bringing awareness to the issue, it will become part of our social fabric, and we will work together to use light more effectively. By sharing her passion for the night sky through the eyes of a thirteen-year-old girl named Joan, Galat hopes to promote the responsible use of light. Her new book is full of facts, stories, and illustrations, and also provides suggestions for readers to reduce light pollution. And although this book is complete, Galat is still writing about the sky. Her next book in the Dot to Dot in the Sky series, called Stories in the Clouds, partners meteorology with mythology. Visit www.joangalat.com to learn more about Galat’s books or presentations.